What can we do to get them interested in learning their multiplication tables? That was the question I was thinking about while trying to figure out what to put on the wall. I knew I didn’t want to do the board that had been done the previous year. A race track, mile markers (0x, 1x, 2x, etc), and a car for each student. Could you imagine the pile up at zero and one? Think! 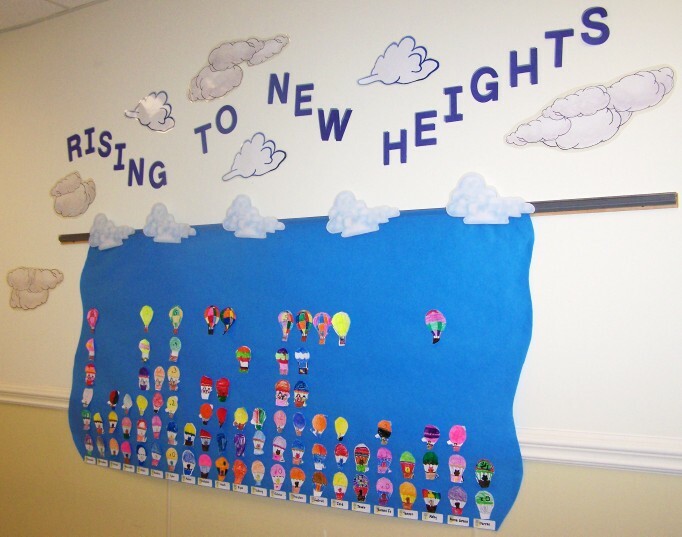 Balloons, then clouds, and the saying “Rising to New Heights” soon popped into my mind. Click! First, I cut paper long enough to hold twenty-two labels with about a half inch apart. Second, I printed a label with their first name as large as possible. Fourth, I looked through the books and found 6 different hot are balloons. (regular plain balloons would work too) I got each of them to around the same size so that all six of them would fit on one paper. I wrote 0x, 1x, 2x, 3x, 4x and 5x and laid them out to fit on the same page. I then made twenty-two copies. I wrote each name on the back of each balloon. If you happen to have the mini-return address labels made up for each child then use them. Fifth, After they said their multiplication fact they received their balloon. Some got zero, one and two at one time, some did it one step at a time. It’s their time now. Have them decorate their balloon. I will tell you markers make it hard to see anything, especially if they colored over the number. Then cut out the balloon. We had them turn it back in so I could put them out on the board, but they can do that as long as they go straight up from their name. When we got done we used this and a graph exercise too. Although for a true graph you would need to go in order on your multiplication table, some of ours did their fives after their twos. Leave this multiplication page and return to the miscellaneous page.